Editorial: This post was first written a year ago but it has been revised and reposted. With Christmas round the corner, you may want to start thinking about some dishes you may want to cook. I am not partial to roast turkey as those we have here are cooked from frozen ones. But I love roast chicken and I think it is a great fit for any home Christmas meal. I have been experimenting with the best way to come up with a tasty roast chicken and sauce which is a convenient by-product of the roasting process. In the Origins of Gravy theory set forth by Walter Matthau in the film of Neil Simon's The Odd Couple, he explained that, when you cook a roast, "it comes." This method that I use makes it convenient to retain the "it comes"and turns it into a beautiful sauce - by just using one carrot and one large white onion. By tasty roast chicken, I am looking for a crisped flavorful skin and succulent meat (not dried out). Like Cantonese Roast Pork, the chicken skin when roasted adds flavour. There is of course some interesting two-step processes which can give very good results i.e. steaming-roasting, sous vide-roasting. I have tried this and they do work except that they do not produce a good deeply flavored brown sauce the way a traditional roasted chicken can. I will post my favourite method here. It may not produce a "perfect RC" but it is good enough for my dinners. Start with a good bird. Here in Singapore, I like the Anxin or "naked-neck" French breed chicken. Sometimes they are labelled as Kampung chicken (more info here). Use one which is medium to large size as they are more flavorful. Mine normally weighs about 1.5 kg or slightly more. The next step is to ensure the chicken is thoroughly clean i.e the liver, inner parts are all removed. Now, this extra step is optional. But if you want to be perfectionist about this, blanch the chicken in hot water for 20 secs and then cool it in cold water. Do this 3 times. This helps to wash away some oils, scum and it also tightens the skin, makes it harder to break and easier for crisping. Next, put it on top of a roasting rack. I prefer to use a concave rack (as you can see in the photos) which fits a roasting tray. Pat dry the skin. Then, brush the skin with some light soy sauce or fish sauce. As Chinese chefs will know, the soy sauce helps the skin to crisp more easily. Put the tray at the top shelf of your fridge to dry the skin. You can do it overnight or for a few hours. If you do not have the time, skipping this step is fine. It is just about how crisped you want the skin to be. Set your oven to 180ºC. Meanwhile, prepare your chicken for roasting. Slice one carrot and one large white onion and scatter the pieces evenly onto the tray. It will absorb and collect the juices from the chicken. Sprinkle some salt on the chicken. If you have thyme or rosemary, insert them into the cavity, place some on top of the chicken and some underneath the skin (do this carefully so as not to break the skin). Poke a lemon with fork and insert into the cavity. The lemon helps the interior to stay moist and the breast parts from overcooking. Poking holes is to ensure that the lemon will not burst and release all its juices during roasting. Alternatively, truss the chicken. If you don't like to do either, it is also fine. 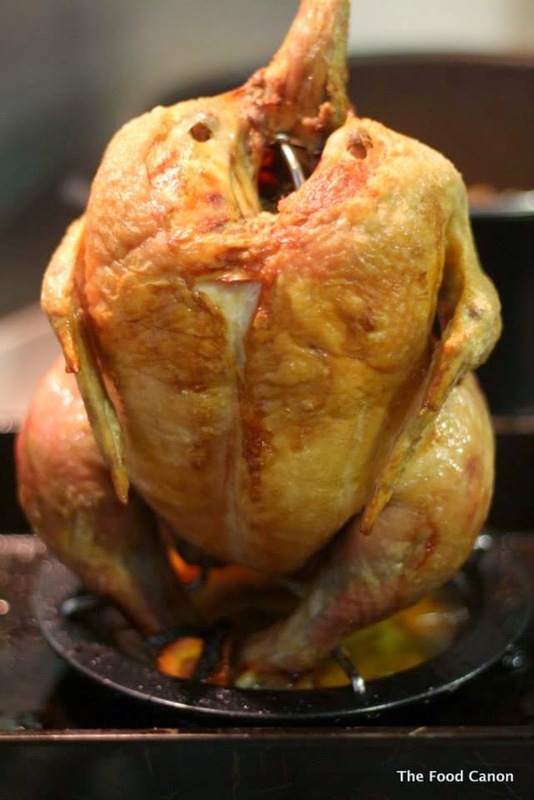 Note that the bottom of the chicken should not be touching the vegetables so there is an empty space between them, ensuring that the whole chicken is being roasted by heat convection (heat through the air) and the bottom not made wet through direct contact with the veg. Put the tray into the oven. The chicken should be facing down, breast meat at the bottom. Depending on the type of oven you use, you may need to rotate the chicken to ensure even roasting and to avoid burnt spots. By the 50-60 minute mark, the chicken should be beautifully roasted. Remove and let it rest and cool down for 20 minutes. Cut off the chicken wings. Cut off the thighs. You can actually gently pull off the drumstick and thigh portion, using a pair of scissors/shearer to assist if you need to. Meanwhile, continue to plate your chicken. Slice off the breast meat, keeping some of the skin with it if you can. The backbone can be set aside or you can choose to plate it. I like to chew on it and so I will plate it. Alternatively, you can of course serve the chicken whole on the table and let diners carve it themselves. The tray of one carrot and one large onion in the oil and juices from the chicken after it is roasted. As for the sauce, this is really easy. You can see the chicken oil and juices in the tray. Pour the contents of the tray into a sauce pot. Heat it up. Add a small cup of water. Use a stick blender and blend it. The sauce emulsion should "magically" appear: the right colour (light brown), the right viscosity and taste. Strain it. This sauce is good as is, with some herby notes from the thyme, some fruity sour from the lemon and salty from the soy sauce/salt. You should not need to add anything else, except for some water. Serve the chicken and the sauce warm. Mashed potato will go well with the chicken and sauce. Some salads for the greens is a great side too. My family loved this roast chicken and I am sure your's will too. Now, there are further steps you can take, such as brining the chicken overnight but I will leave that to another post. Stick-blend the carrot, onion and juices and it will turn into a sauce emulsion. There you go - a lovely sauce after it is blended and strained. On this occasion, I roasted the chicken upright. We are looking forward to your contribution. Do also let your fellow bloggers know about this initiative. They can pledge via the URL above. I have not come across the two chickens from NTUC and not sure what you might be referring to. Not able to help. The temperature for the first 15-20 minute should be 200-220 before bringing it down to 180. It is a common rule for any roasting so as to sealed in the juice. After it is done, another cardinal rule is that it must be "rest" for at least 20 minutes before eating to allow it to be cooked through. If you use "Western" Chicken, they generally have bigger and softer breast because that's the way they were bred. Asian chicken will give you better flavor but the breast tends to dry out easily. Hi WTSim - Yes I agree with your tips. As for the science for it, meat shrinks less in lower temps, thus retain their juices better. That may be the explanation for the idea of "sealing" meat, a popular intuitive idea but does not really have a scientific basis. "Asian" chicken tends to be smaller and more prone to overcooking. Again, with the right temp control, their meat can be moist too. Lower temp to get the meat just right and a higher blast to crisp the skin, which if dried, shorten the blasting time, thus ensuring chicken is not overcooked. I had the joy of roasting some Chicken leg recently and with the help of a Combi Oven, it turn out perfect. I am contemplating getting a Combi Oven in the near future and how much easier it seems to work with a many dishes. I will definitely try out your recipe soon with a conventional oven! May I ask where did you buy fresh whole An Xin chicken? Any hints as to internal temperature - at the thickest part of the chicken - for food safety reasons with this type of roast? Instant-read thermometers are easily available and not expensive, so perhaps some hints as to the "doneness" would also be a good target to "shoot" for. Thnx. Anon - It is just roasting chicken in the oven and I won't normally bother about sticking a thermo in and all that. I have a oven where there is a top and bottom heating element that can be disabled/activated ... May I know for roasting chicken, which heating element should be used?